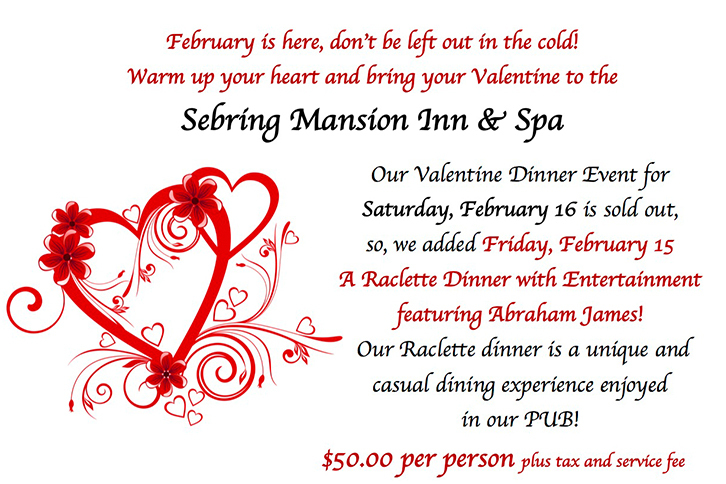 The Sebring Mansion Inn & Spa is hosting a Raclette Dinner with Entertainment featuring Abraham James! A Raclette dinner is a unique and casual dining experience enjoyed in their PUB! The Raclette dinner includes 3 different meats, filet, chicken, and beer brats, mini Yukon potatoes, and bread cubes for dipping in a rich, melted cheese, a glass of Riesling wine, salad, appetizers and dessert. Price is $50 per person plus tax and service fee. Room & Raclette Dinner Package is $450 per couple plus tax and service fee. Reservations are required, call 330-938-0423.